Please Note: If there are not enough students, the class will be cancelled. Create a unique set of ornaments for your Christmas tree this year with this fun Inky Goodness Ornament Workshop. Your tree will be the talk of the town with these fabulous ornaments! They also make wonderful gifts or add splashes of color to your decor. For this 2-1/2 hour workshop, we will be using alcohol inks and metallic mixatives to create colorful, vibrant designs on glass ornamnents. You'll be given a choice of either 4 large ornaments, or 6 medium ornaments to make and take, just in time for the holidays. 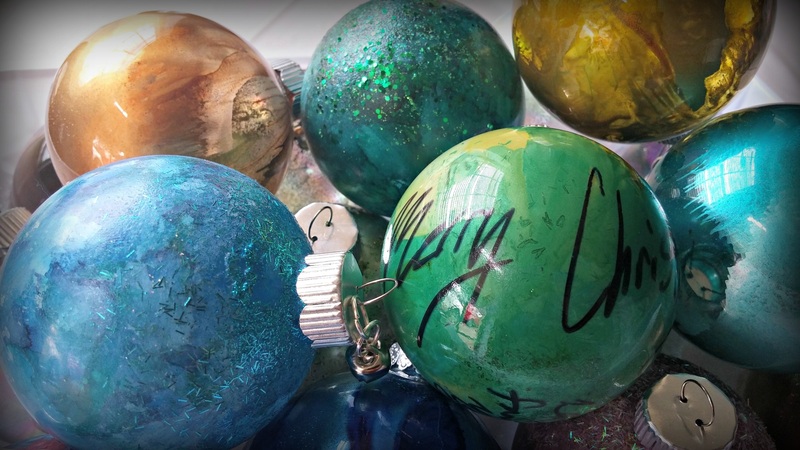 Don't worry, you don't have to be an artist to create these amazing glass ornaments! You will learn how easy these inks are to use, and we'll talk about the amazing versatility of this medium.